I'm intrigued by the idea of subtracting from an inspiration or material to add to the sum of its parts. The open space in a structurally engineered design is as important as its members and this is what I wanted to explore with this design. The project was set by City & Guilds to fulfil the requirements of the Level III Furniture Design course at Warwickshire College. Beyond a limit on dimensions and the specification of a flat open shelf, the interpretation was left to the student. 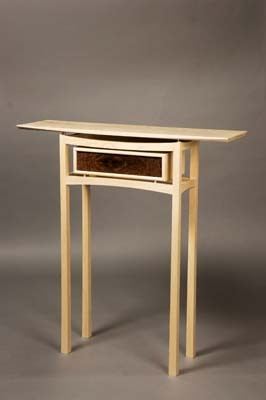 The piece was described as a hall table, which effectively meant it would be both tall and narrow. Because of its oriental influence the table is called Pagoda. It represents the culmination of a sustained effort over some years with the support of friends and staff at Warwickshire College's furniture crafts workshop. I'm very pleased with the way it has turned out and I'm happy for it to be viewed as the fruit of their dedication and faith. This is my first attempt at tackling curves and John Lloyd's advice in F&C154 to draw a full-size pattern became immediately apparent when I began my 1:5 scale drawings. Subtle experiments with curves are difficult at that scale because the differences between ideas can be so small. When dealing with curves a rod is indispensable. I made a bending stick of straight-grained beech on which to strike each of the curves. 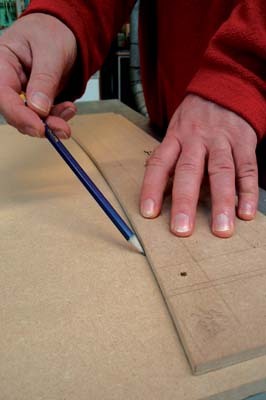 A second pair of hands is useful to draw the lines while you present it to the MDF drawing board. 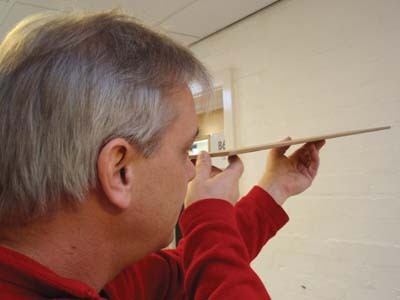 A steel rule can be used for the same purpose and, if you can't find a helping hand, panel pins driven at strategic points along the curve can help. A potential problem here would be the development of 'hardspots' where the stiffness of the rule and restraint of the pin conspire to flatten your line. If symmetry is required you will see clearly whether the curve is symmetrical about its centre line. 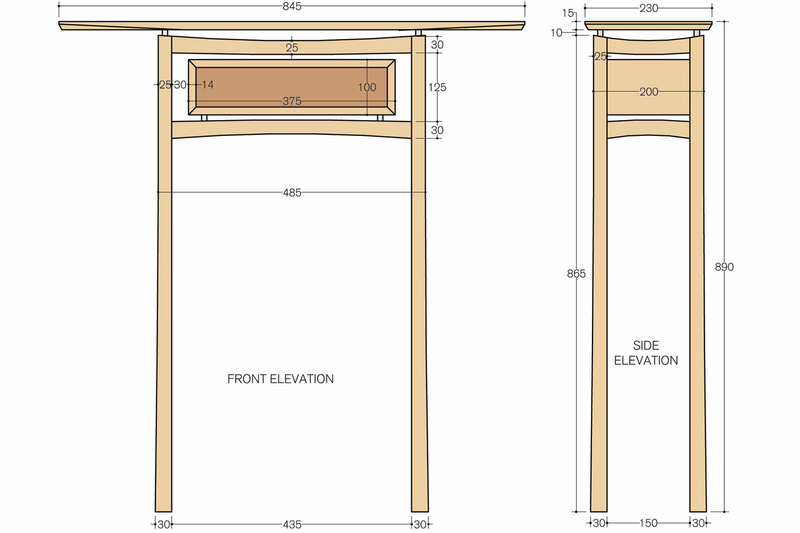 Trim the template until the flipped curve matches the drawn line. 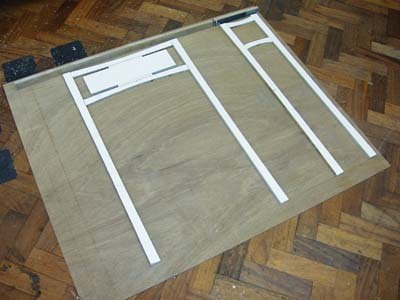 The templates were then screwed to 18mm MDF baseboards for the jigs. 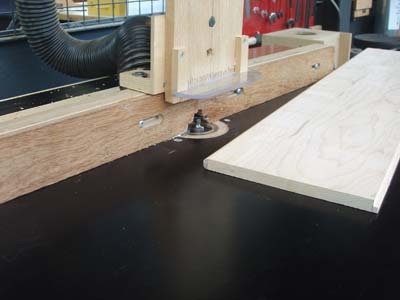 Again, the bulk of the waste was removed on the bandsaw and the template was used as a guide for a bearing-guided router bit in a router table. 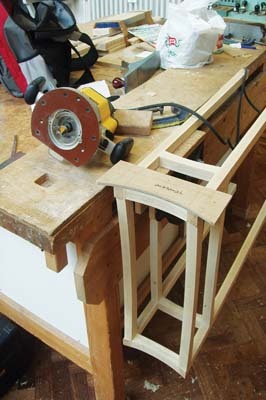 Fences and stops position the components in the jigs. 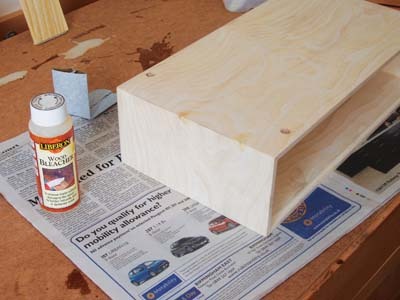 The components were left over length so that they could be secured with a screw through the waste into the baseboard. 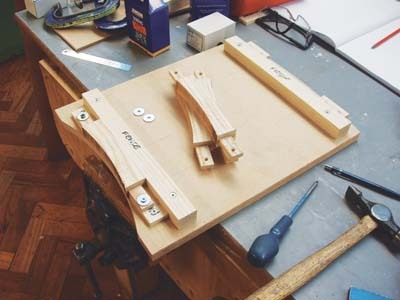 This approach is restrictive in that it doesn't allow for a dry assembly of the frame until the curves have been worked and the tenons trimmed. 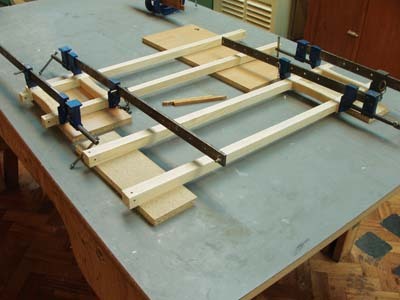 If toggle clamps were available I would have preferred to use them, and if the piece were a commercial exercise I would seriously consider the expense of buying some in. 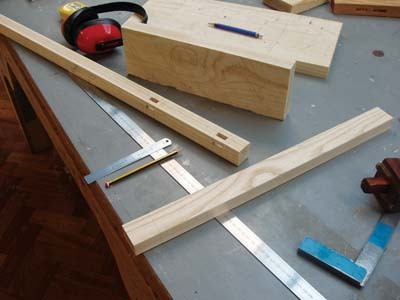 The frame is jointed with traditional mitred mortice & tenons which were machined while the stock was still square. 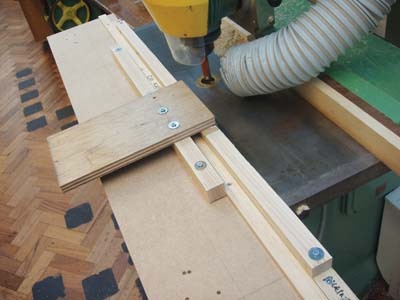 The lower long rails were then bored on the drill press to accept the 10mm aluminium pipe which supports the box. When dealing with outsourced materials and hardware it is well to buy them in and design around them before machining any timber. Although the box supports were sold as 10mm-diameter pipe I knew it was a nominal figure that could vary significantly. After experimenting unsuccessfully with 10mm Forstner, spade and auger bits I found a lip & spur bit to bore a snug hole for the pipe supports. Allen screws pass through the box and pipes to secure the box to the frame so the pilot holes for the screws were also bored at this stage. The holes were then plugged with dry dowels to prevent breakout while machining the curves. 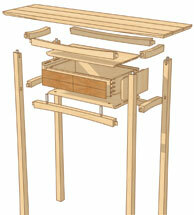 The box is an important aspect of the design. 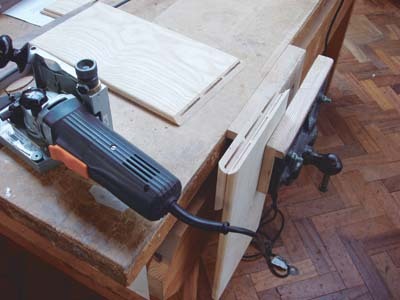 It not only provides useful storage but it offers a reference point from which to view and amplify the curve of the rails. The curves framing the box are very subtle and without the flat planes of the box they could easily become weak and inconsequential. The box provides visual weight at a critical point. 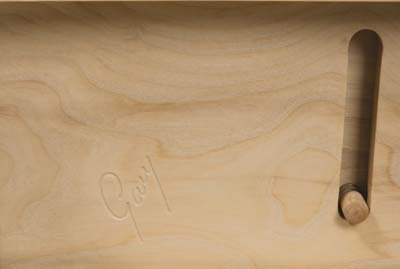 It was made from a single length of ash (Fraxinus spp) to ensure the grain pattern would flow seamlessly around the box. I worried that this was a needless affectation because the view of the box was so restricted within the frame and top. I decided the effort was justified because the bull-nose feature on the opening makes the attention to detail obvious and worthwhile. 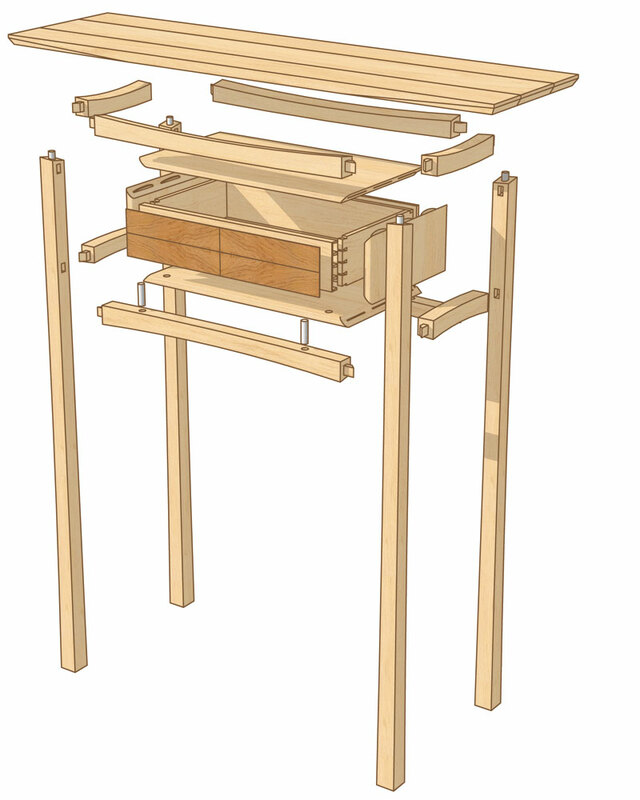 The drawer is traditionally constructed in solid ash with lapped and through dovetails and a solid drawer bottom supported by drawer slips. The veneer is a quarter book-matched flame walnut (Juglans spp). I spent an enormous amount of time fretting over the choice of a drawer handle and never really came to a satisfactory conclusion. The original design specified modern drawer runners with a push-release mechanism and soft-close feature epitomised by Blum, Accuride and other manufacturers but the limits of the brief meant I couldn't find a short enough runner. I wanted the design to be as clean as possible and didn't want to interfere with the impact of the walnut. Plant-on and recessed handles in brushed aluminium, steel and timber all felt cumbersome and intrusive. The back and sides are relieved with 60° chamfers. The slab effect is diluted further with a tapered chamfer on the front edge which allowed me to continue the curved details without removing too much material from the underside of the board. I considered working the curve across the full width of the board but felt the potential for warping was too high. Two arcs were drawn on the front edge and the underside of the board. 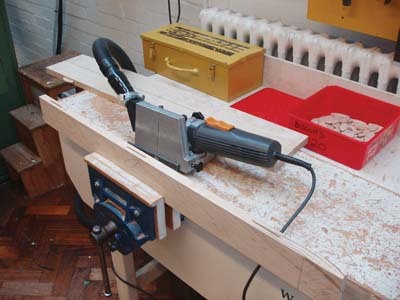 The waste was removed with a finely set jack plane. To maintain the themes of physical and visual levity, I wanted the piece to be as light in tone as possible. Bleached ash has a luminous quality suggestive of ivory or vellum. 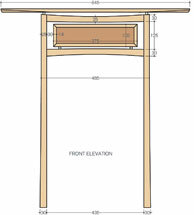 I'd seen and admired a bleached media unit by Aled Jones and decided on the same approach for Pagoda. Rustins two-part bleaching system worked well but not without its difficulties. 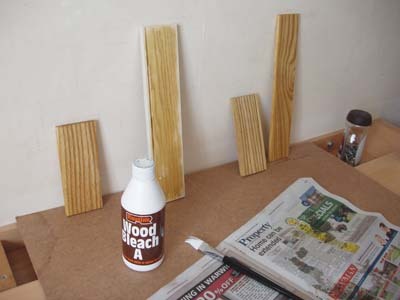 As the bleach lightened the timber it exposed inky spots in a number of components, especially around the joints of the box. I'm not a chemist so can only speculate on the cause which may be the inclusion of ferrous filings in the open grain from machining and clamping.